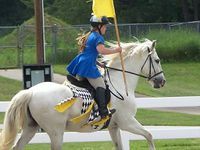 Simple "generic middle ages" riding garb often consists of modern riding breeches and boots, worn with a short sleeved, short tunic, or with a simple dress. 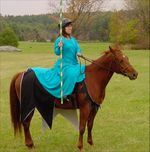 Upgrading the tunic or dress to parti-colored cotehardies dresses up the look without much additional effort, as does upgrading modern riding boots to somewhat more period-appearing tall boots such as those sold by SCA Boots. 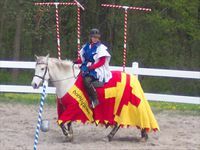 Layers such as a houpelande over the cotehardie, heraldic surcoats, and armor help push one's appearance into "magic moment" territory. 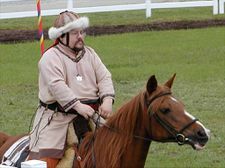 Keep in mind that when you add more layers than you're used to riding in mundanely, you need to train and practice, especially if you add armor. 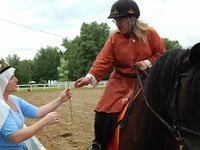 At an event is not the best time to discover that your houpelande sleeves get caught in your reins, or that your horse is afraid of the sound of maile clanking against steel. 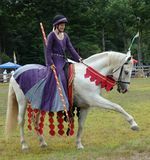 Different time periods and cultures had different styles but nearly all of the times and places the SCA covers used horses for transportation. If people wore it, they probably wore it on the back of a horse too, at least occasionally. Modern safety helmets, while important for all (and required for minors), detract quite noticeably from an otherwise lovely medieval presentation. 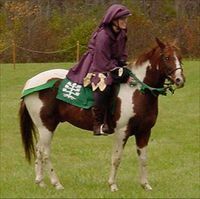 Like a simple saddle cloth for your horse, a basic helmet cover should be part of your essential equipment. 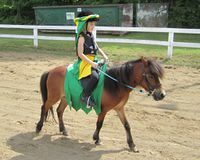 A solid color lycra cover, (such as the Troxel Lycra Helmet Cover) is an inexpensive foundation for decorating your helmet. Duchess Katherine Stanhope has sewn Ducal leaves to hers, above. Aeryn fitzPatrick's lycra cover has a two-color torse and mantling attached to it, like her parents'. 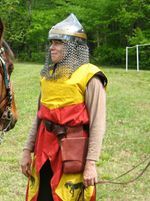 Attaching the torse to the helmet cover not only makes it more secure on the helmet but allows it to be quickly attached or removed for those who do not wish to dedicate a helmet solely for SCA activities. Above, Mistress Ellen du Grandchamp has a magnificent early period helm built around a modern jockey helmet. 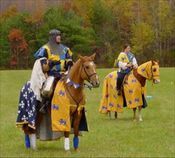 Lady Lilias de Cheryngton has covered her helmet with a rolled hood, while Lord Micheal has built a Mongolian hat over his helmet. Mistress Eleanor fitzPatrick's torse and mantling cover is made in two parts. 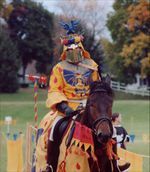 First two stuffed tubes of fabric are constructed, approximately 1" in diameter and several inches longer than the circumference of the helmet. The tubes are stuffed to a medium firmness - enough to hold their shape but not too much to easily bend. 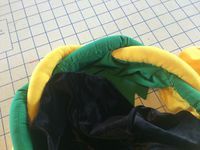 Then the two tubes are wrapped around each other and around the hem until the desired appearance is achieved, then they are cut to length, the ends sewn together and several tack stitches taken around the roll to hold everything together. 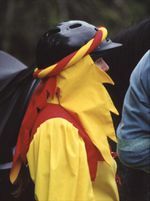 The mantling can be done as a single drape, but Eleanor prefers a three part drape so it doesn't drag on her shoulders as she turns her head. They're lined so the entire thing is reversible as seen in the two pictures of the red & yellow set above. 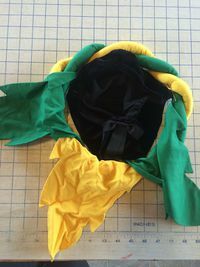 Once the drape pieces are constructed they're hand-sewn to the torse as shown on the green & yellow set, and pinned to a lycra helmet cover. This page was last edited on 29 March 2015, at 21:03.